I have here a few rather unusual books that are getting a lot of attention from my children right now. The median age for these is probably about nine years, though I am far older and have enjoyed each one. Perhaps there is something in this bunch that would appeal to someone you love. 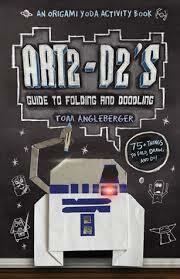 New, from one of our favorite authors, Tom Angleberger, is an Origami Yoda activity book, Art2-D2’s Guide to Folding and Doodling (Abrams, 2013). What a delightful surprise to find that Tommy, Kellen and the rest of the Origami Yoda bunch have pulled together yet another case file, this one to teach us all how to be a master doodler. “Who would want to buy a whole book full of junk like that?” asks Harvey. Answer: we would! Packed with adolescent humor and great drawing tips, this book is stooky! There are blank pages for practicing doodles and color pages to fold. Readers can then combine both skills to make doodle-gami. Angleberger even provides tips on how to photograph your doodle-gami because so many of his fans - dubbed SuperFolders - like to post their creations on origamiyoda.wordpress.com. 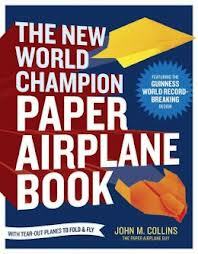 For cub scouts, origami enthusiasts, or, heck, just about anybody, The New World Champion Paper Airplane Book (Ten Speed Press, 2013) is fascinating and fun. Written by John M. Collins and illustrated with step-by-step photos, this book is filled with information on aerodynamics, throwing technique and folding basics. It is scientific and thorough without being overwhelming. Collins designed the current world record-holding paper airplane and has taught hundreds of thousands of people how to fold and throw pieces of paper. He has included in the book a full-color insert of 16 tear-out paper airplane models of regulation-weight durable paper stock. My 9-year-old son can hardly wait for me to hand over this book. He has big plans for a serious fleet of aircraft. I'm hoping none of his creations go flying through his classroom. One of the oddest books I’ve ever come across, Papertoy Monsters: 50 Cool Papertoys You Can Make Yourself (Workman, 2010), is also one of our all-time favorites. Think kirigami and paper dolls gone crazy. My children, ages 11, 9, and 7, took to this paper craft book immediately. I wasn’t surprised. Brightly colored, curious creatures with odd biographies and wicked teeth – what’s not to love? What did surprise me was how many times my children spent hours upon hours at the kitchen counter carefully pressing out the scored templates and passing the hot glue gun from hand to hand. After completing a cartload of creatures, they worked together to make very silly monster-inspired films with the family video camera. 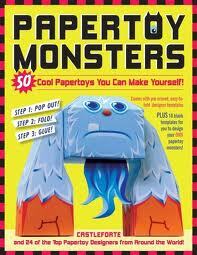 My kids completely devoured the book, leaving only the create-your-own papertoy monster skins untouched. Now they’re asking me to get them another copy! Papertoy building was a beautiful exercise in patience and teamwork. I’m delighted by the way this activity brought the siblings together. April Fool’s Day has already passed us by with narry a prank or trick. We’re just not clever enough to think of gluing a quarter to the sidewalk, or switching the salt and sugar. The good (or bad) news is that it is never too early to start prepping for next year. Enter Julie Winterbottom, author of Pranklopedia: The Funniest, Grossest, Craziest, Not-Mean Pranks on the Planet! (Workman, 2013). It is a collection of blueprints for 72 safe, silly pranks for kids. There are classic gross-outs like making fake dog poop or snot, and more modern annoyances like wrapping 30 rubber bands around your victim’s cell phone to see his surprise when he tries to take a call. Scattered throughout the book are short histories detailing the birth of the whoopee cushion and other famous pranks. In the back, there are silly signs and fake certificates to cut out and put to use fooling your family and friends. 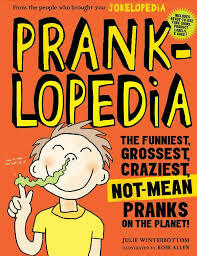 "Pranklopedia" is certainly entertaining to browse through, though some of the ideas are not what I consider “not-mean.” With a little parental involvement the book can provide an excellent opportunity to talk about humor, respect, and boundaries. Without even pulling a prank, parents and imaginative kids can have useful discussions about empathy and predicting the consequences of one’s actions. Michelle Clark absolutely hates to be the victim of pranks. If she finds herself being bombarded by paper airplanes and fake barf, she will rescind this article. Send your comments and reading suggestions to her c/o Richmond Parents Monthly.